So we have what is little and what is much. And there is a relationship between them. How one does with what is little is a clear indicator of how one will do with much. This is stated in both a positive and a negative way – whether you are faithful or unreliable. There was a manager who had squandered his master’s funds and was about to be fired. But then he figured out how to take care of himself. He cut the debts of those who owed his master, so that they would like him and take care of him after he was fired and had no money. He said, “I have decided what to do, so that when I am removed from management, people may receive me into their houses.” Luke 16:4. Through a shrewd use of his master’s wealth he took care of his future. Jesus’ point is that Through a shrewd use of the world’s wealth (giving it to the needy) we take care of our future. He said at the end of the parable, “And I tell you, make friends for yourselves by means of unrighteous wealth, so that when it fails they may receive you into the eternal dwellings.” Luke 16:9 That is, the poor ones we help, will welcome us into the eternal kingdom. And then comes v. 10 which states the principle of little and much, and then in Luke 16:11-12, Jesus applies this principle to the topic of wealth. “11If then you have not been faithful in the unrighteous wealth, who will entrust to you the true riches?” Here we learn that the wealth of this world is not real wealth. True riches, that don’t fail (v. 9) and that one has because of righteousness, as opposed to how things often work in this world, true riches will only be given out in the world to come. “12And if you have not been faithful in that which is another’s, who will give you that which is your own?” Here we learn that the wealth of this world is another’s. But what we are given in the world to come is going to be our own. And in both of these statements it is clear that the “little” has to do with what we do or don’t do in this world with the wealth God gives us. The “much” has to do with what we will be our situation in the world to come – whether we will have the true riches that are our own. And the first, what we do or don’t do with the little, determines the second – the much. Because God knows based on what we have done with what is little, how we will do with the much of what is to come in the kingdom. The key in all of this is, ‘Will we give of our wealth to help the poor and needy?’ This is being faithful in the little, this is being reliable in the little. Then in v. 13 Jesus gets to the heart of the matter. “13No servant can serve two masters, for either he will hate the one and love the other, or he will be devoted to the one and despise the other. You cannot serve God and money.” If we love God, we will do what God wants us to do with the little of this world’s wealth. We will give to help those in need. But if we love our wealth, we will keep it for ourselves and we will not have friends to welcome us into the kingdom. The context here is the parable of the talents. Let’s remember together the meaning of this parable. Jesus is about to go away to the Father after his death and resurrection. And so Jesus leaves his kingdom work to his disciples – the church, to you and me. And to some he gives a lot of responsibility, 5 bars of silver, to some 3 bars of silver and to some only 1 – each according to our ability. And we are to fulfill our tasks. And then Jesus returns for the final judgment. And here we have the little and much principle stated clearly, as the master says to the one who had five bars of silver and increased them, “Well done, good and faithful servant. You have been faithful over a little; I will set you over much.” Matthew 25:21. And again to the one who had three talents and increased them, “Well done, good and faithful servant. You have been faithful over a little; I will set you over much.” Matthew 25:23. Like before with wealth, the “little” has to do with what we do or don’t in regard to serving God with the tasks he has given us to do. The “much” has to do with what we will be our situation in the world to come – what our levels of responsibility will be in the fullness of the kingdom. And once again, the first, what we do or don’t do with the little, determines the second – the much. Because God knows based on what we have done with what is little, how we will do with the much of what is to come in the kingdom. The key here is, ‘Will we serve God and do what he has tasked us to do?’ If we are faithful with the small responsibilities in this life that God gives us, God will give us greater responsibilities and honor in the world to come. But heed the note of warning with the third servant. If we are not faithful here, we will not have a place in the world to come but will go to place of weeping and gnashing of teeth – Matthew 25:30. This principle teaches us that what we do in this life will determine what we have in the life to come. God tests us in the little things of this life, before we get the real blessings of the world to come. Because he can tell from what we do in this life, what we should have in the life to come. If we aren’t faithful in the little things, we will not be entrusted with the greater things – the much of the world to come. So whether it is how we use our wealth in this life, or how we fulfill the tasks that God has given to us in this life, we are being tested. And so my word of encouragement to you this morning is this be faithful in the little things of this world! Be radical in your giving – don’t let fear of being without hinder you. Serve God with abandon – don’t let the things of this world distract you from what is truly important. Do this and you will be blessed with the much of the world to come – with what is true, with what is lasting and with what will be your own – untold blessings in the kingdom of God. We are in a series of messages on witness that is meant to challenge us to become more outwardly focused as a congregation. Whether this is helping the church’s mission here in SW Chambersburg or whether it is in your own areas of outreach where you live or work or hang out. As a congregation we need to be less concerned with being comfortable and with what we get out of church, and more concerned with taking risks to reach out and with what we should be giving to others as we reach out. Last week we began with the letter ‘W’ of the word “Witness” – Why we reach out. And we learned from the Scriptures that our motivation is Christ’s love for people. When we have Jesus’ heart of love we will have a different perspective on people, whatever they might be or seem to be according to the flesh. From the perspective of Jesus’ love they are helpless and harassed like sheep without a shepherd and need his salvation and grace. Well today we focus in on a wrong reason to reach out, and this is the ‘I’ in witness – Idolatry and reaching out. And the idol is the desire to get big; to have a large church, thinking that this is what success means. This is where we idolize growth and getting big as the goal in itself. Now yes, let me be clear, we very much do want to grow and have people come to know the Lord and become workers for his kingdom. But this can easily and subtly be distorted into an idol. And I think this takes place under the influence of American culture where big is the sign of success. And it comes from using a business model where the bottom line is profit and this is compared to getting more people in the congregation. And it can also just be from envy of other churches that are big and seem to be doing well. According to this thinking a successful church equals growing and being big. And so if you are not growing you are a failure. But according to the kingdom of God a successful church equals being faithful to reach out, which can lead to growth and being big, but it might not. Do you see the difference in terms of what counts for success? Bigness in itself vs. faithfulness to do what God says whatever the results might be? That this is true just think for a moment about the parable of the soils. What if a church is in a context where there is rocky soil – trials and persecution, or thorn filled soil – where everyone is focused on the good things of this life? If you are consistently reaching out, but with little or no results are you unsuccessful? Here’s a more concrete example. What if a church is in a Muslim context and you are consistently reaching out but with little or no results. Does this mean you are unsuccessful? Here’s an example from our congregation connected to the block party last week. I know a person who invited someone and he came. I know another person who invited 35 people and none of them came. But who would say that the second person was less faithful than the first? And finally, think of Jesus. Was he a failure because at the end of his ministry he only had a handful of followers? Certainly not! The point is if you are reaching out, you are successful, whether you are growing or not. Because it is the reaching out itself that is the mark of faithfulness, not the results of reaching out. So you can be amazingly, abundantly, fantastically faithful but have little outward fruit to show for it. After all, Jesus said “you will be my witnesses” (Acts 1:8) not you must have many converts. And so the bottom line is that we are witnessing, not that we are growing; it is that we are loving and obeying God, not that we are big. Anything that we make into an idol will take us down the wrong road. The most prominent example here is that we water down the gospel to get people to come. Right? If the goal is to get people, you need to do what it takes to get people. So you lower the bar to suit your audience so that they will respond. You take away the things that are hard or that challenge people’s sin. Well, Jesus flatly rejected this approach. We see this first in Luke 14:25-26. It says, “Now great crowds accompanied Jesus.” And we think, way to go Jesus you’re a success! You’re a winner! You have a crowd. But what does he do? “he turned and said to them, ‘If anyone comes to me and does not hate his own father and mother and wife and children and brothers and sisters, yes, and even his own life, he cannot be my disciple.’” What? Jesus you have to keep the crowd. You can’t go telling them to give everything up for you. They won’t follow you anymore! But this shows us that Jesus doesn’t think like us. Jesus wasn’t influenced by the idolatry of big. He was consumed with faithfulness to God. So when there was a temptation to choose between having more people and watering down the gospel, he chose speaking the truth. Another example of this comes from John 6:26. Before and after Jesus fed the 5,000 a crowd was following him. And in this case he said to them, “Truly, truly, I say to you, you are seeking me . . . because you ate your fill of the loaves.” What Jesus? Why would you challenge them like this. They wanted to make you a king! But again, Jesus doesn’t think like us. Jesus wasn’t influenced by the idolatry of big. He was consumed with faithfulness to God. He went on to talk about faith in him in such a way that most deserted him and he had to even ask the 12, ‘Will you leave me also?’ Jesus wasn’t interested in just getting a crowd. His goal was sharing God’s truth with everyone, even if the crowds went away. Yes, you can grow a church without God being involved. Indeed there are non-Christian religious groups that grow very rapidly and are large. But God is not in it. And there are churches that have grown because of a dynamic leader who was later found to be full of sin all along. And there are churches that grow because they tickle itching ears and tell people what they want to hear. But God is not in this. So yes, you can grow a church without God, but this isn’t true growth. It is based on the flesh; on us and our skills or personality or techniques.And so this puts the spotlight on us. Look what we did. And this is in part why so many have become famous, celebrity pastors. They made their church grow! So they write their books and they go on tour and so forth. But true growth only comes when God moves and people’s lives are changed. And he does this is thousands of different ways, not through some specific technique or strategy or leadership style. In fact God loves to use the weak and the lowly; those who no one expects to do anything great. Paul says in 1 Corinthians 1:27-29, “But God chose what is foolish in the world to shame the wise; God chose what is weak in the world to shame the strong; God chose what is low and despised in the world, even things that are not, to bring to nothing things that are, so that no human being might boast in the presence of God.” This brings the glory to God. As Paul said, we may work, but “only God (is anything), who gives the growth.” – 1 Corinthians 3:7. It’s all about God, not us. Now, none of this is meant to excuse not reaching out, and we have work to do here, as do most churches. And it is good to look at how we are doing in our outreach – if it is ineffective – to see if we are doing it poorly and to make corrections. And you can also turn all this around and make an idol out of being small or not growing. You know, we are small because we are so much more faithful than other groups! When really it is because we don’t reach out or we have created cultural barriers that keep people away. So let’s focus on being faithful to God to reach out, taking risks and giving of ourselves to others. This is the measure of our success in the kingdom of God. And even if we are not bursting at the seams we can still be encouraged and joyful in our walk with God knowing that God is pleased with us. Let’s focus on presenting the full gospel to others, even if it means that fewer people will come. Let’s not change his word and gospel message just to get our congregation bigger. If people don’t come or leave because of this we can still be encouraged and joyful in our walk with God knowing that God is pleased with us. And let us focus on praying for God to move as we minister in his name, to change people’s lives. If there is not much fruit, this isn’t a matter of discouragement, so much as it is a call to greater prayer and reliance on God to bring about the growth, which only he can do. And we will give him the praise when he does his work. This morning we are looking at another story of faithfulness, in this case, the life an ancient believer whose life and faith I believe should be an encouragement to us in our Christian lives. Justin is his name, and he illustrates for us some specific aspects of faithfulness to Jesus which I will highlight at the end. He was born near Shechem, Samaria around 100 AD (A1-1) so he is a very early Christian. He was born just 30 years after Jerusalem was destroyed in 70 AD, and around 70 years after Jesus had his conversation with the Samaritan woman not far from Shechem. He was not a Samaritan, or a Jew however (D – 28). He was born to a pagan family (A1-1) so he had no Christian influence growing up. Around 130 AD he had a conversation that changed his life. He most likely lived in Ephesus at this time. And as was his custom, when he wanted to get away to think, he went to a field by the sea where he could be alone. He continued on in the role of a philosopher, complete with dressing in the traditional cloak (tribon) of a philosopher (D–1); but as a Christian who encouraged the study and practice of the teachings of Jesus (D-8). He was a scholar and a teacher. Later he moved to Rome and started a school. While he was in Rome he wrote two defenses of the Christian faith. One was written to Emperor Antonius Pius, the other to Emperor Marcus Aurelius. These can also still be read. In these he stood up for believers who were being persecuted and killed for their faith, often based on rumors and baseless objections to Christianity. Christians were also despised as atheists because they did not worship the gods or offer sacrifices to them. Justin explains, “what sober minded person then will not acknowledge that we are not atheists, worshipping as we do the Maker of this universe and declaring . . . that he has no need” of sacrifices. (A1-13). Although it was illegal to be a Christian at this time, the Roman government didn’t usually seek Christians out to persecute them. If, however, they were exposed by others and didn’t recant they would be condemned. So, if you had a neighbor who didn’t like you; or a business competitor that wanted to get rid of you; or an enemy that wanted you dead – all they had to do was accuse you of being a Christian to the government. And once the charge was made persecution and often death followed. Well he had enemies. One was a philosopher named Crescens. He and Justin had held public debates before about Christianity. As Justin said at one point, “I . . . expect to be plotted against and crucified . . . perhaps by Crescens . . ..” (A2-3). Tatian, a student of Justin, said that Crescens had indeed sought to kill them both at one point (Address to the Greeks). Whether it was Crescens or someone else, eventually he was arrested along with several of his students, including a woman named Charito. The Prefect announced the sentence, they were to be scourged and then beheaded. Justin, and the others, remained faithful and were killed for their faith. Later, a group of Christians secretly obtained their bodies and gave them a proper burial. This happened in 165 AD, so Justin was around 65 years old. This is also how Justin came by the name that he now bears – Justin “Martyr.” He was a true witness to Jesus, which is what the word martyr actually means, in his case, he was a witness even unto death. And just as the parable of the talents teaches us in Mathew 25:14-30 we have all been given tasks to do for God as we serve him in our earthly lives. What ministry has God called you to and how is it going? Justin was faithful to his calling in a time when being faithful was dangerous. Are you faithful to your task in our time? He argued effectively in writing and in person in debates and conversations and when he was on trial before the Roman Prefect. We are called to bear witness before others as well, even if they are less intense situations. But God will also be with us as we speak to give us wisdom. Do you have the courage to speak out and trust God for the right words? Justin confessed Christ when he life was on the line and died for it. And so we can be sure that he did and will receive a blessing from God, even as he said in faith that he would before the Prefect. Do we identify with Jesus and confess him in front of others? Or are we ashamed of him and hide our faith because it is a socially awkward situation or because it might affect our social standing or reputation? Don’t think that you can be ashamed of Jesus in these “little” ways and that when more serious persecution comes and your life is on the line that you will suddenly confess Jesus. All these lesser situations are practice for the more serious. It is those who are trained to identify with Jesus in everyday life who will confess him with boldness when their lives are on the line. The other numbers refer to the sections of each work. I have started sharing with you the stories of faithful Christians from time to time, people who lived after the time of the Bible. I am doing this to point out that we can be radical followers of Jesus in whatever context we find ourselves in, not just in Bible times. And I am doing this to encourage us to live more radical, faithful lives as Christians. And to that end, in each case, I want to highlight how their lives embody specific aspects of faithfulness to Jesus from the Scriptures. 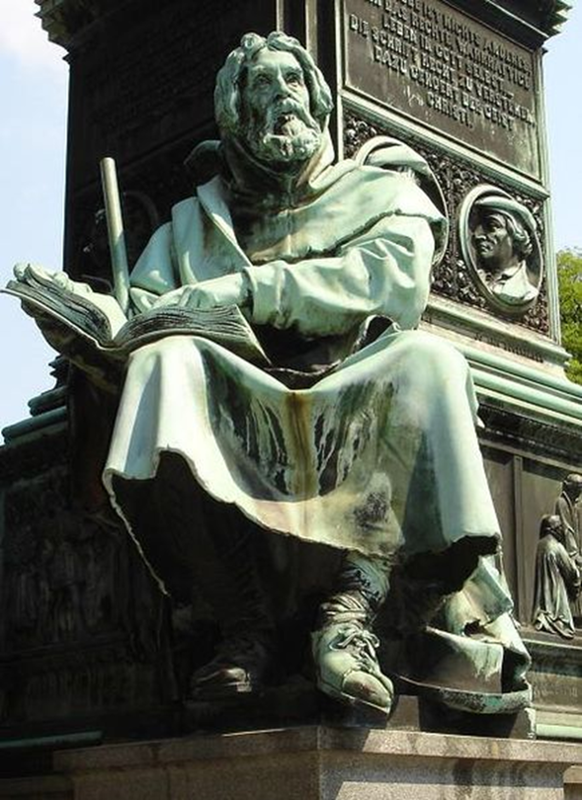 He was from Lyon France and lived from around 1140-1206. This is a statue of Waldo, in Worms Germany. Of course, no one knows what he actually looked like. Much about Waldo’s story is shrouded in mystery, coming from his enemies or from later legends about him. I will try to give you some basics. 1. His name was Valdesius, which is Latin, but has come into English, whether correctly or not, as Waldo. He is usually called Peter Waldo, but it is not at all clear that his name was Peter. All we know for sure is his Latin name Valdesius which he signed in one instance. His name in the local language was probably Vaudes. We’ll call him Waldo. 2. He was a wealthy merchant. The merchant class was emerging at this time and gaining social and economic power, and Lyon was a real commercial center. It is possible that he handled the investments for the archbishopric, which was suspected of charging interest on the poor. If true, he was involved in oppressing the poor to make himself rich. In terms of real estate he is said to have owned “ponds, groves and fields, houses, rents, vineyards, mills, and fishing rights.” http://www.fordham.edu/halsall/source/waldo1.html This doesn’t include his bank account. He had some serious wealth in a time when most were dirt poor. 3. He gave up his wealth to preach the gospel. He was already concerned for his soul regarding his wealth, and then he heard the story of the rich young ruler and how Jesus called him to give up all his wealth and to come follow him. And he was disturbed that Jesus said, “it is easier for a camel to go through the eye of a needle, than for a rich person to enter the kingdom of Heaven.” (Matthew 19:24). (Which, by the way, doesn’t refer to a small gate in the wall of Jerusalem). Waldo heard in all this Jesus calling him to give up all his wealth so that he could preach the gospel, and this is what he did. Regarding his preaching, one source gives this account of what sounds like his first public pronouncement. He cried, “No man can serve two masters, God and mammon.” Then his fellow-citizens ran up, thinking he had lost his mind. But going on to a higher place, he said. “My fellow-citizens and friends, I am not insane, as you think, but I am avenging myself on my enemies, who made me a slave, so that I was always more careful of money than of God, and served the creature rather than the Creator. He also criticized the church’s accumulated wealth and how many of its officials lived in luxury. You have to understand that Scripture was in Latin, which the common person didn’t know. So people were completely dependent on what the church taught them.He brought the Scriptures into the common person’s language so that they could hear them for themselves. He is said to have memorized this book. 5. A movement began – the poor of Lyon, or the poor of Christ. People responded to his preaching. A number gathered around him and also gave up their wealth and began to preach. This would have been around 1170-1175. They would go out two by two, as in the Gospels. They would share from the Scriptures and call people to repentance. Both men and women went out to preach. They lived off of the support of those who heard and received their message. As one enemy wrote, they “went from village to village, going into people’s homes and preaching in public squares and even in churches . . .” (Bernard Gui). But this was a real problem because only trained clergy were allowed to preach, and then only under the supervision of the local Bishop. In 1179 some of his followers appeared before the Third Lateran Council. They sought the approval of their movement by the church.They showed them their Bible translation. There was some openness to them, but they were also ridiculed for their perceived ignorance of theology. In 1180 Waldo signed a confession of faith to establish that he was orthodox. But they were still eventually forbidden to preach. In 1184 the Council of Verona made excommunication the punishment for those who persisted in preaching. Waldo and his followers were excommunicated and expelled from Lyon. It is said that Waldo responded to all this by saying, “We must obey God rather than man”quoting Acts 5:29 and Peter’s words to the religious authorities of his day who told him to stop preaching. Waldo died, apparently of natural causes, somewhere around 1206.
were killed. They were forced to flee into the Alps to find refuge. This is a picture of the burning to death of some of them in Toulouse in the 1200’s. From 1487-1489 a Crusade of 18,000 troops was sent against them, to persecute and kill them. But first let me say, you don’t have to die to be faithful. I don’t want to give the wrong impression with these stories of faithfulness. We all have to lose our lives in this world in various ways by giving them up to follow Jesus. But not all will be killed for their commitment. Waldo died a natural death. Regarding his faithfulness, 1. His fearless preaching of the Gospel stands out. Jesus said in Matthew 28:19, “Go therefore and make disciples of all nations . . ..” In a time when it was assumed that everyone was a Christian, he preached and called all people to repentance. And when some tried to stop him, he accepted rejection and persecution to continue to do this. He is a model for us of zeal to reach out and share our faith in our much, much easier set of circumstances, where the biggest issues for us are shame, laziness or making time in our busy lives. Jesus also tells us all in Luke 12:33 – “Sell your possessions, and give to the needy.” We should all give of what God has blesses us with to help those who have needs. And we can also give sacrificially, even cutting into what we need (Mark 12:41-44). 3. He obeyed Jesus simply and radically. It is Jesus’ purpose that we do everything that he teaches. As he said in Matthew 28:19, everyone who is baptized is “to observe all that I commanded you,” that is, all that he taught the apostles. As he says in Luke 6:46, “Why do you call me ‘Lord, Lord,’ and not do what I tell you?” We are called to obedience. Waldo heard what Jesus said, he listened to the Spirit and he acted. He did not need any fancy explanations or pressure, or an inspiring message to act. And he certainly didn’t listen to any who would explain away what Jesus said. He read it and he acted on all that Jesus said. And he obeyed Jesus even when it was very difficult, giving up everything he had and living off of the charity of others; even when the authorities, even the church authorities, told him not to; even when it brought him persecution. Let me end with a call to commitment. We all only have one life to live. Why not give it to Jesus fully and radically? Why not give it as a monument of your love and devotion to him? Why use it up on the mundane things of this world, especially accumulating wealth and trying to live comfortably? Don’t waste your life. It is a gift from God. Don’t let the distractions of this world and earthly pursuits take up your life so that you wake up one day and you are old and you haven’t served or loved God in dramatic ways. What will any of this life’s comforts mean in the context of the final day? Why not choose to do something great for God? Lift up your eyes to see greater things than just living life like everyone else is, or just being a nominal Christian. What is God calling you to do? Do you have the courage to follow him? It is never too late. *I have relied on Gabriel Audisio’s The Waldensian Dissent, and also John Driver’s Radical Faith, who in turn draws on Amedeo Molnar’s work.